Black-chested Buzzard-Eagle (Geranoaetus melanoleucus) is a bird of prey of the hawk and eagle family (Accipitridae). It lives in open regions of South America, it occurs mainly in mountains in the northern parts of the range, between 1600 and 3500 metres of elevation in Colombia, but also up to 4600 metres according to the location. Length: 62-80 cm, weight: 1700-3200 g. Often seen soaring in thermals currents while looking for preys. It has long and broad wings ( wingspan: 175-200 cm) and short, wedge-shaped tail. The adult has a white underside, sometimes with fine blackish stripes, feathers of the neck and the lowest dark feathers of the breast are somewhat elongated. Adults have an ash-grey-and-white zone on the wings, the silvery white seen clearly from afar. The female is characterised by a reddish-cinnamon hue to the upper and underwing secondaries and she is much larger than the male. The Black-chested Buzzard-Eagle gives high reedy whistles close to the nest and often when flying. The food is primarily small mammals, some birds, snakes and lizards, seasonally insects and also carrion.On the photo our Sheala. Bald Eagle (Haliaeetus leucocephalus)is a northamerican bird of prey . It is the national bird and symbol of the United States of America. The adult is mainly brown with a white head and tail. Males and females are identical in plumage, but females are larger. Its diet consists mainly of fish, but it is an opportunistic feeder. On the photo- Reagan -9 year old beautifully stained male. It is the largest bird of the presented at our shows. He weighs almost four kilograms and has a wing span of 2 meters. Steppe Eagle (Aquila nipalensis) is the national animal of Egypt. Inhabiting the steppes of south-eastern Europe and Asia, from Romania to Mongolia. Wandering. Birds from the Far East winter in India, the other - in Africa. This is a large eagle with brown upperparts and blackish flight feathers and tail. Wingspan of 1,65–2,15 m. Food is mostly fresh carrion of all kinds, but it will kill rodents and other small mammals (up to the size of a hare). Birds up to the size of partridges. It will also steal food from theother raptors. Female Zula is with us since the beginning of the park foundation, which is almost 10 years old. American Kestrel (Falco sparverius) a small falcon, and the only kestrel found in the Americas ( it is also the smallest falcon in North America ) . 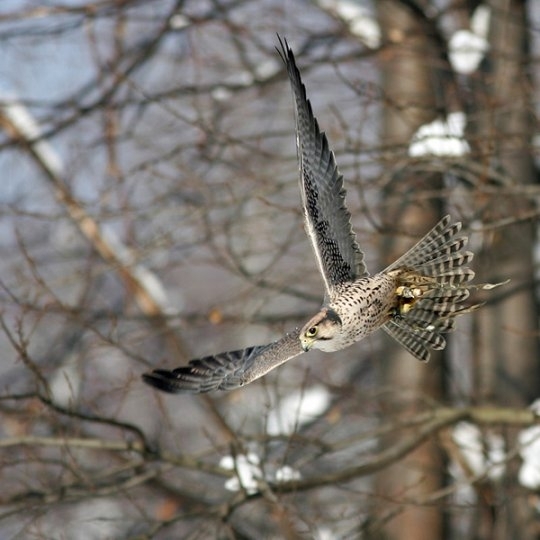 hunts by hovering in the air with rapid wing beats or perching and scanning the ground for prey. Its diet consists mainly of grasshoppers, lizards, mice, and other small birds. We have a couple of one of the world's smallest falcon in the park. Male weighing about 90 grams is named Hercules, a 100 gram female (pictured) is Lea. Common Kestrel (Falco tinnunculus) This is the smallest bird of prey living in Poland, measures from head to tail 32–39 cm. It has long wings (wingspan of 65–82cm )as well as a distinctive long tail. Plumage is mostly light chestnut brown with blackish spots on the upperside. On the underside buff with narrow blackish streaks. This species is able to see ultraviolet light. Its diet consists mainly of mouse sized mammals. On the photo Kiki. Lanner Falcon (Falco biarmicus) occurs in southern Europe, Asia and Africa. Proportions: 35–50 cm long (wingspan of 95–105 cm), weight 500-900g. Lara - two-year old female, came to us as a little chick.Ske likes to fly very high and is a specialist of speed which is famous for falcons. Laggar Falcon (Falco jugger) medium-sized falcon came from South Asia. He is a close cousin of the lanner falcon, however, he is darker overall, has blackish "trousers" and is more skilful flyer. Our two year old male's name is Loki and he's amaizly agile bird. Northern Goshawk (Accipiter gentilis) secretive and difficult to observe bird, who likes to fly low to the ground. Versatile hunter, hunts for prey on land and in the air. Adults always have a white eye stripe. He has short, broad wings and a long tail, both adaptations to manoeuvring through trees in the forests where it lives and nests in. On the picture 7 year old male, Hans. Common Buzzard (Buteo buteo) Most common bird of prey in Europe .They are fiercely territorial. The food mainly consists rodents, amphibians and other small animals, even carrion during the winter. Female is slightly larger than the male, but both sexes colored the same way. Pairs usually mate for life. Strictly protected species.On the photo Bianca.